The EU has pledged to help Greece with its debt woes and looming bankruptcy at a summit in Brussels. However, to some experts it seems too little, too late, as they say both the euro and the EU are now doomed. The leaders of the EU presented Greece with difficult conditions to receive the remainder of its bailout: the country could gain vital funds if its parliament passes fresh austerity measures. However, such measures are extremely unpopular among the population, which presents a major challenge for Greek officials. 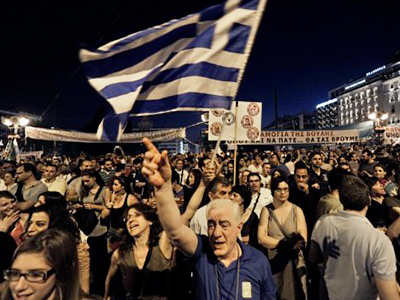 Nevertheless, the Greek government proposed a further 28-billion euro budget cut over five years. If approved next week, it will mean Athens gets its hands on another 12-billion euros of cash, as part of the current rescue package. 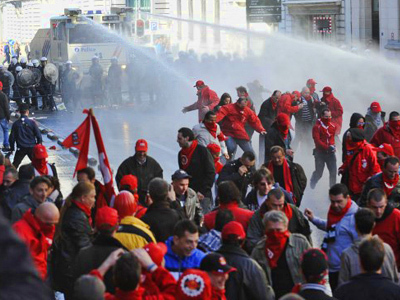 However, the bailout itself is not seen by many European politicians as the right solution. “The leaders are unanimously wrong again,” claims Nigel Farage, Member of the European Parliament. “They’d been wrong about Greece from the very start. She should never have been allowed to join the euro in the first place; she wasn’t so addicted to it. They were wrong to bail her out the first time; they’re wrong trying to bail her out the second time. If the Greek parliament on Tuesday accepts this package, then this time next year I’ll be talking to you and there’ll be a third bailout,” Farage told RT. Euro-skeptics go further saying the euro itself is dead and buried. 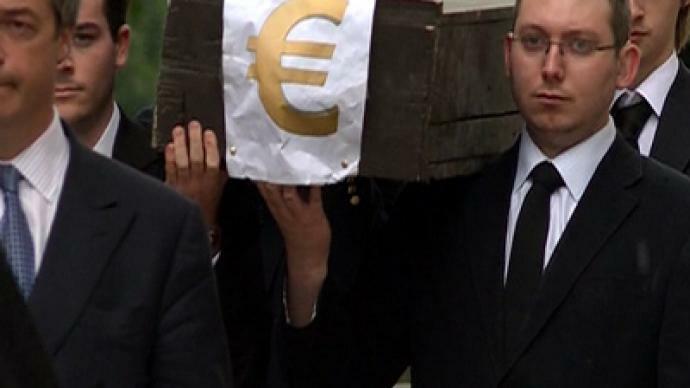 They organized a mock funeral for the ailing single currency in Brussels. “To me, and to a lot of people, it is beginning to collapse: seeing bailouts, billions in tax-payer money, especially from the Germans footing a lot of this bill,” says Jamie Illingworth, from the UK Independence Party and one of the organizers of the mock funeral. “I think the public’s had enough of it, and I’ve had enough of it”. 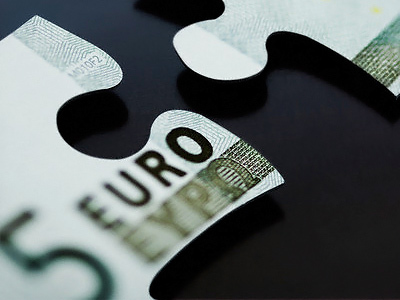 While the European leaders are extremely excited claiming the future of the euro can still be resurrected, many people in Europe do not believe that is the case. ­Journalist and author Johan Van Overtveldt believes Greece leaving the euro zone would not only be a good thing for Greece itself, but might also end up saving the rest of the Europe. 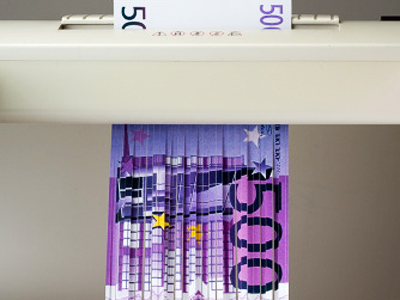 ­Raoul Ruparel, an economist with the Open Europe group, believes the euro does not have what it takes to survive, as the system of bailouts has been proven to fail. “Greece didn’t fare well with the first bailout and the austerity conditions which it imposed, and Ireland and Portugal aren’t doing much better,” said Ruparel. 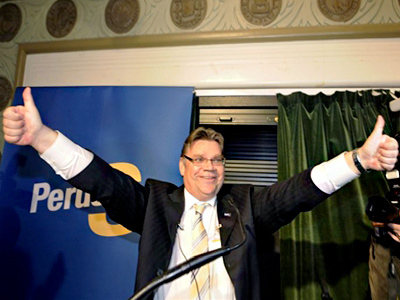 “Now that they’re looking at the second Greece bailout, that won’t really change anything. It might buy Greece a few years, but in the long run it looks inevitable that they will default,” said Ruparel.